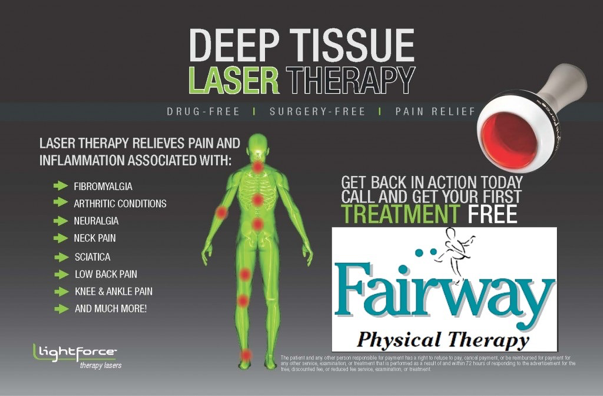 Fairway Physical Therapy uses The LightForce™ Pro Class IV Laser. Class IV therapy lasers provide a deeper depth of tissue penetration and ultimately provide a dose that results in positive reproducible outcomes, by accelerating your body’s own natural healing process through photo-bio-stimulation. Laser Therapy is a surgery-free, drug-free option for individuals suffering from both acute and chronic pain. Treatments are fast, safe, and painless. Results can be seen in 3 to 5 treatment sessions and the treatments have a therapeutic effect continuing for up to 18 hours after the treatment. . Laser Therapy is FDA cleared and endorsed by professional clinical organizations, including the World Health Organization (WHO), American Physical Therapy Association (APTA), and the International Association for the Study of Pain (IASP®) and over 3,000 research studies have been conducted in the field.